Tomorrow is Ash Wednesday, the beginning of Lent. The forty days of Lent represents the time Jesus spent in the wilderness, enduring the temptation of Satan and preparing to begin his ministry. Lent is a time of repentance, fasting and preparation for the coming of Easter. During this season of Lent, we would like to invite friends and supporters of ReconciliAsian to pray for peace in the Korean Peninsula. The Hanoi Summit between North Korea and the United States abruptly ended and many were disappointed at the missed opportunity to officially end the Korean War. However, we believe that God, the Author of Life and Resurrection, is ultimately in control- above any political or national powers. We commit to following the Prince of Peace who has broken down the walls of hostility between us and will live into that reality with prayer and action. Dear Lord, send your Spirit to establish peace between nations. and now threats of nuclear war. that has endured 70 years of hostility and division. Strengthen the will of those who work for reconciliation and peace. And give us the peace which the world cannot give, Amen. During this season of Lent, we also want to encourage those living in America to contact Congress and let them know that it's time to end the Korean War. Here is a link provided by Mennonite Central Committee on how to contact your representative. May all of us who have been called to the ministry of reconciliation continue to lead with hope and resilience during this critical time in Northeast Asia. What is trauma? How does trauma impact our homes, churches, and communities?How can we heal from trauma? What are some tools to build resilience from trauma? We invite you to examine these pertinent questions with us for three full intensive days this month. Jeehye Kim is a Fuller graduate with a Marriage and Family Therapist degree and an active board member of ReconciliAsian. Sue Park-Hur is a co-founder of ReconciliAsian and the Denominational Minister for Leadership Development for Mennonite Church USA. They have served in Korean immigrant churches for 50 years combined and have deep insights about the pain and strength immigrants possess. As Strategies for Trauma Awareness and Resilience (STAR) practitioners, Jeehye and Sue are excited to co-lead this program. Feel free to share with friends who speak Korean and are interested in learning skills to help churches and communities to break out of the cycle of unhealed trauma. We are excited to have Dr. Lee join us for a live webinar tomorrow. Dr. Inyeop Lee is an assistant professor of politics and history at Spring Arbor University in Michigan. He recently co-wrote a book entitled, Politics in North and South Korea: Political Development, Economy, and Foreign Relations (2018). 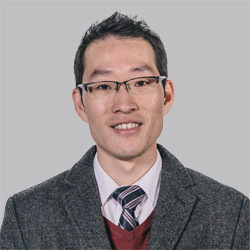 Dr. Inyeop Lee is originally from South Korea and earned his two master’s degrees from Seoul National University and George Washington University. He finished his doctoral dissertation on the U.S. foreign policy toward North Korea at the University of Georgia. His research interest is East Asian Security and Politics and U.S. foreign policy, and he teaches various courses in International Relations, Comparative Politics and American government. For those of you in Southern California, you can meet Dr. Inyeop Lee in person. He will be the main presenter at Reconciliation in the Korean Peninsula Conference. -Dr. Inyeop Lee will address "Past, Present, and Future of Peacemaking process in US-NK relationship"
-Dr. Barnabas Park will address "Religions in North Korea"
We hope you can join us! The events are FREE but donations are welcomed.